Those of you who have a full third brake light bolted onto the rear of your cab, as opposed to those of us with cargo lamps, may have noticed that only the center portion of the third brake light illuminates upon the brake being depressed. No, nothing's wrong with your Ranger. No shorts, no fuses, no bulbs blown. So why aren't the outer two bulbs working? Well, if you unbolt the lens, you'll find that Ford was kind enough to stiff you on how many bulbs you get, defeating the purpose of having a full third brake light in the first place. Well, in this how-to, I'm going to tell you how you can fix this problem, assuming you don't wish to install cargo lights instead. The first thing you need to obtain is a cargo light/brake light harness off of another ranger. This is loads easier than trying to find two mismatched sockets that will twist and turn into your lens then wiring them in. 1993 on up will all work, to my knowledge. Your millage may vary. Once you have the harness, remove your third brake light lens and install the new cargo harness into the housing; then take it over to your work surface. Simple twist and lock, nothing much to explain here. Having the harness installed in the housing isn't 100 percent necessary, but the lens will keep everything from flopping around, making it easy for you to solder. Yes, solder. No crimp connectors! You can get a cheap iron and solder from harbor freight tools if you don't already own one. In addition, you'll also need some good electrical tape, a pair of automatic wire strippers and solder of course. Get that iron warming up, and let's begin the modding. 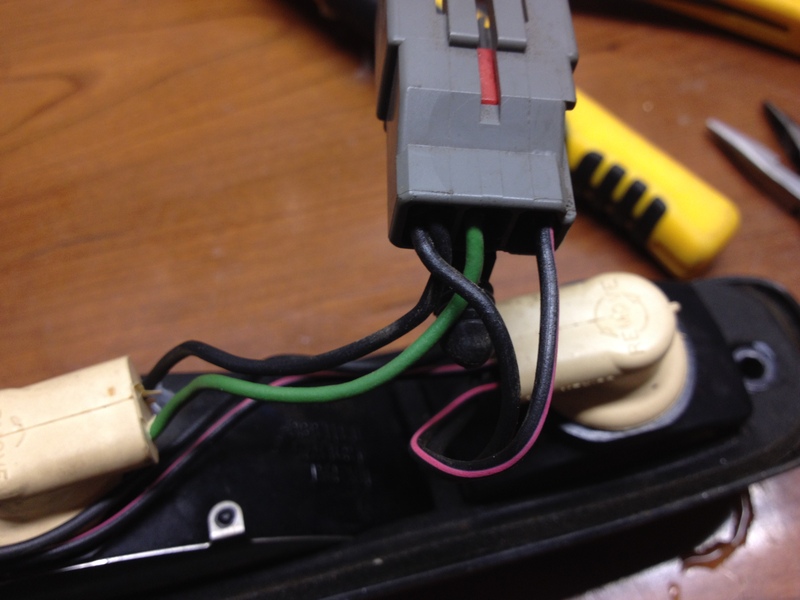 On the plug of your cargo harness, you'll see three wires. These wires are usually black, green, and black with a pink tracer. Black is ground, green is usually brake, and black with pink is usually the cargo lamps. If the colors are different, it's easy enough to see what color wire comes off the center bulb. Step one, cut the cargo lamp wire coming off the plug. Leave a little extra if you want to go back later. The cargo lamp wire is black with a hot pink tracer in this particular harness. Step two, take your automatic wire strippers and open up a section of copper then flow a good amount of solder onto it. You may need some flux, as the solder may simply run off and melt something. <sidenote>, if you don't own or like automatic strippers, you can cut and strip the wire as well, or use a utility knife to cut a portion of insulation off. Step three. 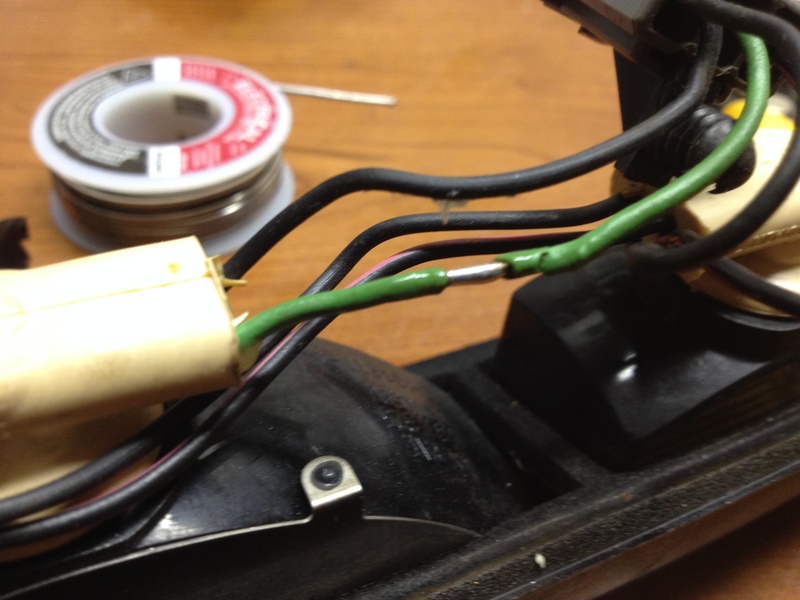 Tin the cargo lamp wire then solder onto the open space of the green brake wire. You should have a strong connection where you soldered. The fourth and final step is to take your electrical tape and wrap up the solder joint as well as the other end of the wire you cut earlier. Otherwise you'll blow a fuse. All that's left to do is populate all three sockets with bulbs, incandescent or LED if you're so inclined. Plug it in and have a friend step on the brakes. If you did it all correctly, all three bulbs in that harness should illuminate. Enjoy your, real, full third brake light!